I now do a big chunk of my Web reading on my iPad. And though I've used several different RSS clients and online services on my Mac to cope with the Web’s fire-hose gush of news, blogs, and long-form journalism, I’ve settled on just three apps to help me get to Web content on my iPad: Reeder, Instapaper, and Flipboard. While there are plenty of RSS clients for the iPad, Reeder ($5; ) makes RSS browsing more intimate and immersive than anything you could get on the Mac. No other client I’ve tried—not NetNewsWire (free; ), not Byline ($5; ) , not Pulse (free; )—has embraced the iPad interface as fully as Reeder. You can swipe through stories, pinch to expand feed folders, and slide stories left or right to mark them as favorites or as unread. 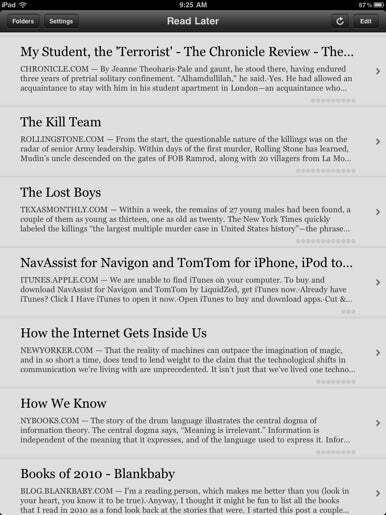 And Reeder displays your feeds in a clean, clutter-free interface. My favorite Reeder feature, though, is its tight integration with a variety of sharing and saving services. Simply tap and hold on any link within the app, and a pop-over menu appears that lets you share the link via Twitter, Facebook, e-mail, and Instapaper, among other options. What’s more, you can (and should) customize which services appear. Because Reeder has built-in support for Readability, it works just fine for feeds that post summaries only: Reverse-pinch (or tap the R button) and Reeder will fetch the full text. Like many other newsreader apps, Reeder syncs with Google Reader, so your feeds can always be consistent no matter which device you’re using to read them. I send longer articles from Reeder to Instapaper all the time. Why? Because the iPad version of Instapaper is awesome. For people who aren’t already familiar with it, Instapaper ($5; ) lets you save online articles for later reading. As you surf the Web or read your RSS feed, you mark articles you’d like to read later, when you have more time. Instapaper saves the article’s text and images to its server. You can then revisit an article at any time on the Instapaper website or—better—through its iPad app. There are other services like it, but I don’t think any of them match Instapaper’s mix of power and simplicity. You can customize the way Instapaper presents your saved texts. You can adjust its brightness (independently of the iPad’s own brightness slider). You can also toggle between Light and Dark modes; the latter switches to light gray text on a black background, which is good for nighttime reading. You can also control the font, font size, line spacing, and margins. You can navigate through pages by tapping to turn a page, swiping to scroll it, or (my favorite) tilting to scroll: The more you incline the screen, the faster the words scroll. Regardless of the way you navigate a story, the reading experience is excellent. Stripped of flashing ads, suggestion modules (the “You might also like…” prompts), and other inessentials, articles are eminently readable. Even though Instapaper has some tools that connect me to my favorite social networks, Flipboard (free; ) specializes in such tasks: Once you supply your credentials for Facebook and Twitter, Flipboard pulls in the text and images from links posted in your feeds. It’s like reading a magazine that your friends edit. The interface even mimics the paper-based experience, complete with 3-D page-turning animations. It provides big, easily readable text previews, but also pulls in the full Web page for the linked article. Like so many great content apps, Flipboard integrates with Instapaper, so you can send articles there for reading later. But even on its own, Flipboard offers a smart, familiar approach to browsing the content that your friends recommend. Though it won’t be released until fall, Apple’s promised iOS 5 update will add a few wrinkles to the iPad Web reading experience. The new version of Apple’s mobile operating system introduces two new Safari features: Reader and Reading List. Reader’s been around on the Mac OS X side since the introduction of Safari 5 in June 2010. The Reader button appears when Safari detects that you’re looking at an article or essay. Tap that button on your iPad in iOS 5, and Safari presents a new view, focused on that article’s text in a large, readable font. Ads, navigation, and other traditional Web accoutrement vanish, leaving just the content you’re after. Reader even fetches subsequent pages of multipage articles in many cases. Reading List will compete a bit with Instapaper, but only slightly. With Reading List, you’ll save Web articles that you’d like to read later. Unlike Instapaper, though, Reading List doesn’t actually save the text of the article; rather, it stores only the title and URL of the page you’re saving. It’s more like a synced, transient bookmark than a full-fledged deferred-reading service. Based on what I know now, I'll be sticking with Reeder, Instapaper, and Flipboard.